How times change. In 1984, when Amitabh Bachchan was still playing the angry young man, his cure for the malignant tumour of political corruption, in Inquilaab, was to become Chief Minister and whip out a machine gun and pump bullets into the members of his party. Now that he’s older – and, on screen, milder – his methods are less severe, more practical. 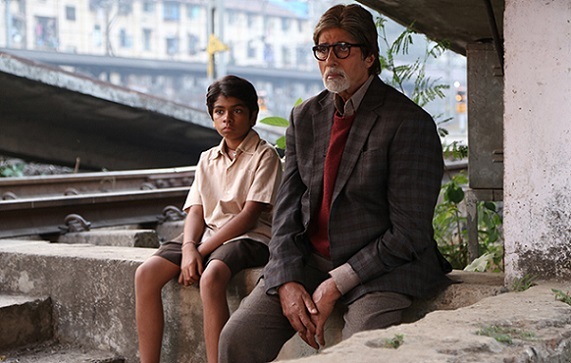 In Bhoothnath Returns, he’s still appalled by the self-serving nature of politicians. He still decides to make things right by standing for elections, by changing the System from the inside. But this time, he leaves it to the people, to us. If we want change, we have to vote in the right people. I was reminded of that other political drama from 1984, Aaj Ka MLA Ram Avtar, where Rajesh Khanna becomes Chief Minister. At the end, he addresses a gathering and says that when we want to marry off a daughter or a sister, we carefully consider the boy’s pros and cons and come to a decision only when we are really sure he will take care of his wife. Why, then, are we so uncaring about those we elect to take care of the country? Why do we vote on the basis of religion, on the basis of who we know, or on the basis of who promises us more goodies? If we are dishonest when it comes to voting, then why should we be surprised when the people we elect to power turn out to be dishonest? Midway through these elections, it’s a sobering thought. But Bhoothnath Returns, directed by Nitesh Tiwari, isn’t a sober movie. One of the problems with it is that it doesn’t know what kind of movie it is. At first, it looks like a kiddie romp, with Bhoothnath (Bachchan) leaving the world of ghosts – some kind of castle in the clouds – for another stint on earth, where he befriends a boy named Akhrot (Parth Bhalerao). With his tweed coat and thickly framed glasses, Bhoothnath looks like a retired English professor, but as in the earlier film, Bhoothnath, he’s charged up by the presence of the boy, who is delightful (and Bhalerao plays him without a trace of self-consciousness). Akhrot likes to show foreign tourists around Dharavi, where he lives, and he exaggerates the horror-show aspects of life in a slum – “tadka lagake” is how he cheekily calls it. But he needs more money, and Bhoothnath suggests the perfect scheme. Bhoothnath will drive out ghosts from under-construction buildings and Akhrot will pocket the fees from grateful builders. And while doing this, the film slowly transforms into a gentle Rajkumar Hirani dramedy: Munnabhai Bane Mukhya Mantri. (Before this, though, there’s a brief hint at a Manoj Kumar social drama, when, over a Mehengayi maar gayi-like song, we’re shown the reality of the unshining India.) Bhoothnath and Akhrot encounter lazy and corrupt babus, and they decide that something needs to be done about it. Soon, they find themselves in the office of a lawyer (Sanjay Mishra), asking if it’s necessary to be alive in order to stand for elections. The satire in these portions is top notch, and the realisation that we need a bhooth, with its supernatural powers, to fix things is both sad and scary. At the same time, the film isn’t all feel-good fantasy. There is the sense of a debate when Bhau (Boman Irani; is there another actor who balances cruelty and comedy so expertly? ), Bhoothnath’s competitor in the elections, offers to step down because he can never hope to match Bhoothnath’s powers, and, unlike Bhoothnath, he is bound by society and laws. This, really, is the problem, isn’t it? We want good things to happen. But, being in a democracy, we also want these things to happen the right way, the liberal way, the lawful way. How surprising is it, then, that nothing ever seems to happen? And then, the film becomes yet another movie – a tearjerker, unfortunately. Bachchan is given a few too many speeches, and worse, Akhrot is put in danger. Suddenly, the director begins to wield a bludgeon. Instead of amping up the optimism – we see kids, future citizens, joining Bhoothnath’s party as workers, but nothing comes of this – he decides to make things “realistic.” (The lawyer gets to voice these misgivings.) Yes, we know bad things happen to good people who decide to enter politics, but if you want to tell that story, you shouldn’t wait for the last half-hour of an already overlong movie to get to it. Still, as a social document, Bhoothnath Returns isn’t without value. Inquilaab and Aaj Ka MLA Ram Avtar were released within months of each other, and they came to be considered zeitgeist films, filled with bitterness and cynicism and rage. Three decades later, we’ve had, almost back to back, Youngistaan and Bhoothnath Returns, which are filled with simple-minded hope and the belief that good things will happen to good people. Have we really changed that much? Or is it just that the multiplex popcorn goes down better when things don’t get too disturbing? I liked the film, in spite of the things you have mentioned in the final paragraph. Yeah, Amitabh Bachchan has a few too many speeches, but with him speaking, I have no problems in listening, for few actors, even today, are better with monologues. Plus, it helps that the speeches aren’t too, well, speech-like. His conversation with the cops, while certainly intended to convey a message, is also a humorous one, with Bachchan’s deliberate use of multiple words that end with -tion. As for the speech he delivers to the people in the slum, that too has its share of delights, especially with the references to how we would have cartoon characters winning elections if we had the same laws as in some western countries. In fact, till that speech, I was enjoying the film thoroughly. It is only when Akhrot is threatened, and then injured, that things stop being as enjoyable as it had been so far. Those final thirty minutes or so should have made been made much differently to fit in with the rest of ‘Bhoothnath Returns’. But all things said and done, it’s still one of the best films I have seen thus far this year. How come you said not a thing about Bachchan’s performance? And what about the songs and the star cameos? What did you think of those? What if people persist on voting for those who are already known to be dishonest? The reasons why people vote the way they do are baffling. One feels like losing hope in democracy. A bhoot is needed to fix things in countries other than India as well. But disappointing to hear that nothing comes out of it at the end of the film. Will see it anyway though for the satire. And may I mention what a complete change over from the story of Bhootnath…they had to come up with something different since the first one was just a remake of the Canterville Ghost but I was not expecting a political satire! I read this because I am not sure I will see the movie, so I disregarded the spoiler warning – but I have to say, this is another example of too much reveal. You’ve given away so many plot points, and indeed, mood points, that I feel I have, in fact, seen the movie. I am a bit disappointed that you have begun this new trend of spoilers – as I said in that other comment, it seems to be a general-purpose-alibi which allows you to reveal far more than you used to earlier. I do wish you would go back to your earlier more writing, which was more veiled on the plot and stuck to a insight-level review, rather than a narrative-retelling. Urvashi: If there is a good chance that you’d not see the movie then spoilers are a good thing, no? You’d not have to worry about what the conflict was and even how it was resolved. You say “I feel I have, in fact, seen the movie”. That is terrific na? Having a movie watching experience without watching the movie. Conversely, you can watch the movie first and then read the review and that is how these reviews have always been intended. This way the reader gets a lot from the review, even a few punch lines and “match the following” with another totally unrelated movies. If you don’t know the language you are also given a free tution class. I can now say “tadka lagake” cause it apparently means spicing things up. What fun. Actually, that *is* my question, Rahini – are these reviews meant for those who’ve already seen the movie? Then, of course, my crib about spoilers is not relevant. However, I didn’t get that impression in the past – when I’ve read the reviews before seeing the movie : then I only got insights into what kind of a film it was without much revealed about the plot. That is something that I find changed now. You are right that if I don’t plan to see the movie then spoilers are fine – and that is why I paused to read this and yes, the spoilers here don’t spoil the movie for me, but they do validate my impression that the spoilers are more extensive than they used to be. @Rahini: Spot on – I read BR’s review or for that matter (any other review) after the seeing the movie or if i am _not_ going to see the movie. This one i am not going to see. If i am in 2 mind if i _might_ see the movie then i don’t go to the reviews at all. Urvashi/ Rahini David / venkatesh: This is a real struggle I’ve faced right from the beginning. If you’re too careful about spoilers, you cannot really discuss/analyse a movie threadbare. OTOH, too many spoilers aren’t good either. Will need to work on this more. Urvashi, thank you for bringing this up. I took a look at the “Queen” review and I agree that the last para was too detailed and gave away the end. Till then, though, I didn’t feel there was anything that could kill one’s vieiwng. Anyway, shall keep this in mind. Rangan it is probably because you are adding the spoilers word nowadays. What a nice little note here, about this blog as well as the people who comment here. Thank you, tumblr person. I think Rahini has a good point – if I look at your work as “articles on movies” and not as “reviews” then I guess that would work well. Maybe it’s in my head, that I see them as reviews, where a degree of tiptoeing around plot secrets is necessary. Re your earlier reviews…err.. articles 🙂 – you had a more zoomed-in approach, is what I feel – there were in depth discussions of a scene, yes, but it was like taking a small part of the movie and blowing it up for greater analysis. The current work appears to be more of a long view – in that there are greater plot discussions, more detailing of the narrative. Anyway, thanks for listening – your honesty about your work is one of the nicest things about your blog. I read Baradwaj Rangan’s reviews sometimes before seeing a film and sometimes after seeing a film. As long as the film is not a suspense thriller, the spoilers really do not matter for me. Even some film synopsis give away too much these days.